The wrapper tells you how many fruit snacks are in the bag. Estimate how many of each flavor is in your bag before opening it. Write a fraction for each flavor. Then, graph your flavors. How did your bag compare to your peers? Do you think that the flavors are evenly distributed? Find a friend and compare your fruit snacks. Who had more cherry? Did you have the same amount of cherry? Compare each flavor using greater than, less than, or equal to signs. 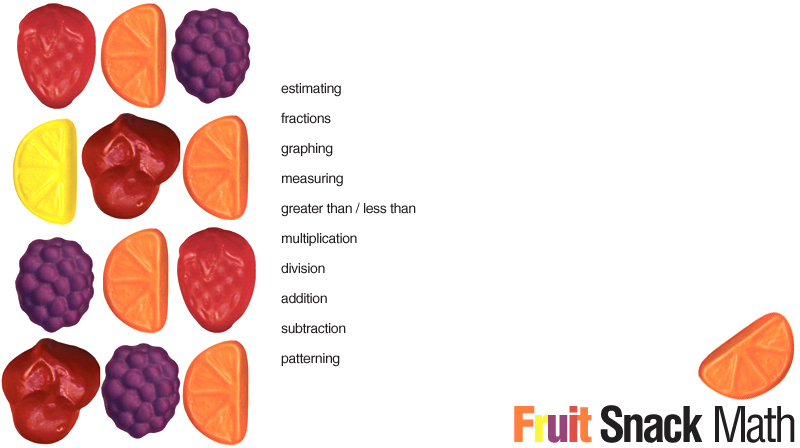 Create a multiplication array with your fruit snacks. Then, practice division. How can you divide your snacks evenly if you shared your bag with your mom and dad? Write addition and subtraction number sentences: What is the sum of your strawberry and grape (2+3=5)? If you ate all of your orange and lemon, how many fruit snacks would be left (12-5=7)? Make different patterns with your colors. Did you have any difficulty because of the colors in your bag? Growing Gummy Bear - grow a gummy in water and measure! Gummy Worms - How long can a gummy worm be stretched?